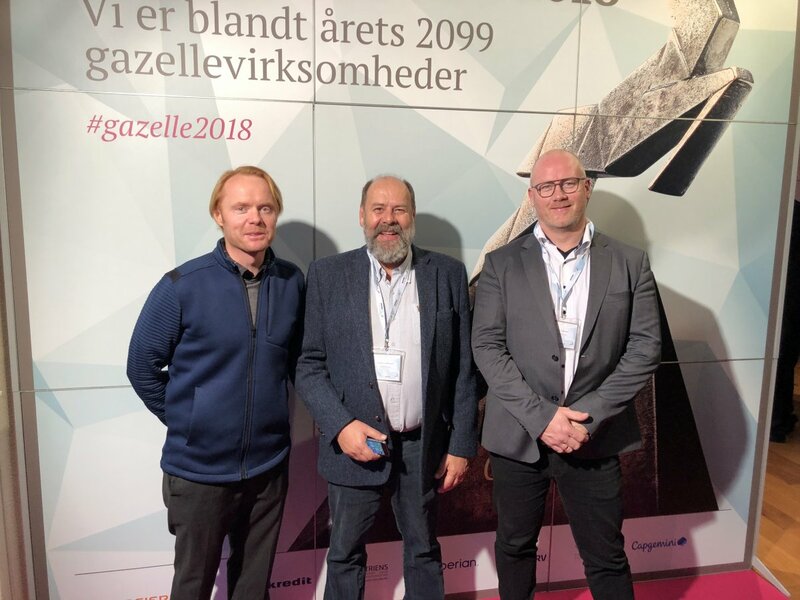 FairWind A/S was awarded a Gazelle award from Danish newspaper Børsen for 2018. The selection is made by Greens Institute of Market Research, and the criteria are objective and based on data from the Danish Commerce and Companies Agency. Requirements to win include publishing four consecutive P&L’s, having positive growth year-on-year and more than double turnover over a four year span. The survey includes only A/S and ApS entities. The award was received on November 14th, 2018 by Steffen Steffensen, Chairman of the Board; Glenn Aagesen, COO Service & Offshore; and René Kildsgaard, CFO. “FairWind is proud to run with this prestigious herd of business Gazelles once again,” said CEO John Funch, who could not participate in the award ceremony due to a business trip related to developing FairWind. “This year we celebrated our 10 year anniversary, starting with only eight men and one project, and now working with almost 900 technicians in over 35 countries. FairWind has established several regional hubs this year alone, including in Spain, covering Southern Europe and Latin America; and in Ukraine, covering Russia, Ukraine, and CIS countries. The North American branch, FairWind Inc., was acquired from EU Montage in 2017. FairWind is also set to establish a new regional hub in Taiwan following an exclusive agreement with Siemens Gamesa Renewable Energy to realize offshore projects in that market, and has expanded scope to include a new high voltage department.